Right On Interactive marketing automation aggregates data, automates campaigns, scores profile and engagement, and graphically shows customer lifecycle. Work for Right On Interactive? ROI is a very powerful tool. It's ease-of-use makes it even more powerful because, as a marketer, I do not need to involve the IT team. Plus, the ROI team is very attentive to our needs. So far, I do not have any dislikes about the software as a whole. We do have a couple of rendering issues in the UI, but the ROI team is working on fixing. If you are working with an agency or in-house team to develop email or marketing automation campaigns, bring the ROI team to the table at the beginning of the planning. This will make the process much smoother to deploy. We are solving many business problems. First, we are getting a detailed understanding of the customer lifecycle - how long does it take to convert. Second, we get a better understanding of prospects vs. potential customers and how to address each audience by getting a focused view of the customer journey for each segment. This helps us market more efficiently. "We have a highly positive experience using ROI and with their client success team"
One of the strongest capabilities of the ROI solution is its ability to model sophisticated multi-step drip campaigns. Using the drag and drop campaign builder makes creating them easy. Combined with its segmentation builder, ROI lets us get highly targeted campaigns online quickly. The one thing I dislike is a personal productivity nitpick. The sort/filter on list pages does not persist when you leave/return to the list. We get a lot of value from ROI. Our inbound marketing needs are pretty straightforward, and the system lets us get where we need to be, quickly and easily. My recommendation to others, particularly those with sophisticated database marketing requirements, is to take a close look at ROI. The system is capable of pulling in and processing multiple data sources to create highly targeted audience segments based on RFM and other analyses. We are solving the problems one faces without a campaign management and marketing automation solution in place. Our ability to target audiences with relevant and timely content is increasing our conversion rate, and moving leads more effectively through each stage of the customer lifecycle. "ROI - The Adaptable Platform"
*You are assigned an account manager who helps with both the short term needs and long term strategy as well as very quick, helpful assistance through a ticketing system if they are not available. *Ever changing product - A different product from what it was a month ago, year ago, etc. They do keep an eye on what's out there, as well as listen to user feedback, and are constantly making changes and additions to improve the product. Overall, I think ROI is a great product which would meet the needs of most marketers. Not currently as feature packed as some MAPs but quickly evolving. The web based solution can be a bit slow to respond at times. It only becomes a nuisance if you're in there a lot. They are very good for the price. When considering alternatives, take into account the full cost of the support you will require. With some of their competitors, the support difference alone could be a 30k+ premium just to parallel ROI support. This was our first MAP so we weren't sure what to expect. ROI has helped us leaps and bounds over where we were. We can now view and score prospect activity to send to sales, gain insights into what's working and not (emails), and create drip campaigns to keep our company top of mind for the prospect. The ongoing supportive relationship form the ROI team. From simple clarificaiton or refresher questions to complex situations I've always received very helpful direction and insight. While we have brought insight of our CRM data, the team has been great at taking that data to the next level with specific and tangible (and fun!) tools and tactics. Occasional glitches with segmenting, exporting, template layout, and saving have caused delays and frustration with usability of the tool. Though it does takes two to tango, our biggest obstacle to overcome has been the long process of integrating with our CRM. Obviously the more work you complete up front to align your CRM with ROI the better, but truly putting in the time to prepare both systems for a closed circle of communication is vital. With that completed, you can jump right into using the full capabilities of ROI! Prior to working with ROI, we had only dreamed of having such informative and tangible data regarding our leads. ROI also helped tie together our digital marketing efforts that had been disparate prior to. "Fantastic Customer Life Cycle Marketing Software"
Right On Interactive (ROI) is an amazing platform with immense customization options. It's ability to adapt to any business environment has made it a go to solution for our business as well as a frequent recommendation and deployment for our clients. The team at ROI also does a fantastic job of helping guarantee success in deployment and ongoing utilization. One of ROI's biggest strengths can also be it's biggest challenge. The customization and integration options in the tool make it very versatile, but for business wanting something to take off the shelf and deploy it may be difficult to fully maximize the effectiveness of the system. If you are looking for a solution that has a team that will truly back you up and make your dreams come true, then ROI is the product for you. Be sure to make a list of integrations you would like and expect to review your business challenges and be engaged by a team of super smart and fun folks. We are using it at Raidious to manage marketing and communications with our subscribers, prospects, clients, and advocates. We have been able to leverage new insights into our customers and prospects and organize our marketing and sales efforts in a focussed and effective manner. "Great product and even better people!" The potential for this product is endless. There are so many different options ranging from a simple one and done campaign to an intricate drip campaign that covers every scenario you could ever dream of. The new campaign builder makes this even easier with its visual presentation. If all of this wasn't enough, the staff at ROI makes using this product even easier. Their dedication to their customers is evident from day one. They answer questions quickly and simply. They are flexible and accommodating to fit into your schedule. This system is extremely customizable, which means there is a certain amount of training that needs to happen to maximize the results. That being said, the staff at ROI works incredibly hard to make sure you have every bit of information you need to make the most of this software. And they do an amazing job. Go through the training and be amazed at everything ROI can do for your business. Not only have we been able to send out emails to clients and potential clients we have also been able to track what has come from those emails using the reports available. "Incredibly pleased with our purchase six months into working with ROI's Lifecycle Marketing platform"
We are approaching the six month mark of being on board with this software company and wanted to review our experience thus far. The sales team was very systematic and professional. Our salesperson, Lori Grass was thorough in assessing our needs and made sure she understood our goals and challenges before giving us a customized proposal. She hit the perfect balance of moving us along in the sales cycle while patiently addressing our questions and concerns. We spent a month carefully comparing ROI to several other providers of marketing automation software and chose ROI based on two main factors: flexibility and service. The other providers had standardized products with little ability or willingness to be flexible to address our particular needs. We would be required to fit into their system with little customization possible. 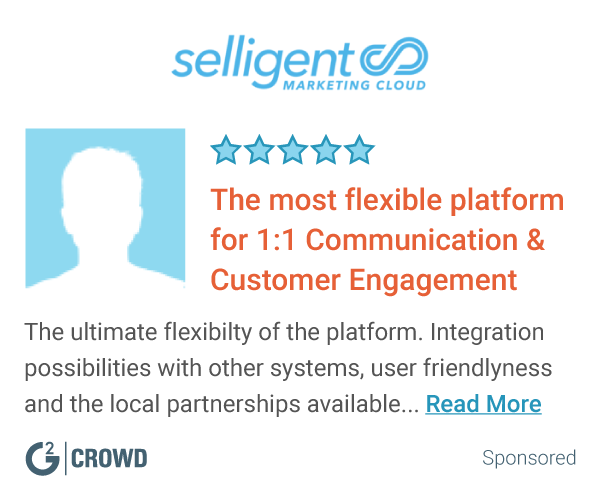 When we read the reviews of the different products on G2crowd.com, the comments consistently touted ROI’s strong focus on providing fast, attentive customer service. We have found this to be true in our six months with them. Most small/medium issues are addressed the same day and we receive communication if an issue will take more than 24 hours to be resolved. Once we signed the contract, we were passed to the onboarding team who immediately scheduled with us. I’m sure many have experienced the frustration of being put on a lengthy hold once the ink was dry. This was not the case here. We were scheduled to pass the information needed to setup our account the following week. We got a good example of the personalized service offered when our unique configuration warranted the attention of Amol Dalvi, the CTO of the company. I am doubtful that any of the other marketing automation companies we reviewed would have devoted the time of their chief technology officer to our unique needs. Once we became familiar with the basic functions of the software, we were referred to the customer success team to help us plan how to get the most out of our purchase. Several team members worked with us regarding our two distinct client bases to understand how to implement a Life Cycle marketing program, attracting and retaining customers while moving them along a continuum of engagement. We pledged to utilize all of the functionality of the software and are well on our way to making good on that promise. The customer success team has been extremely responsive to our perhaps greater than average number of requests for guidance and clarification. One note of caution: Although the sales team in no way misled us into thinking that “marketing automation” is literally “automated,” requiring little or no effort, we can see how the term could mislead a marketing department to believe that this is a “turn the switch and go” product. In order to fully utilize the functionality of this comprehensive software package, the purchasing company needs to be fully committed to spend the time and dedicate staff to understand and implement the software. Do your due diligence and research the other marketing automation platforms that are out there. We believe that the ability and willingness to customize their product around the client's needs coupled with their excellent customer service will lead you to make the same decision we made, ROI! One application that we chose to implement required some detailed and complex programming, as we wanted to contact a representative of the prospect, instead of the prospect him/herself. Technical Project Manager, Suzanne Zaleski spent the better part of a week parsing code to accomplish this request. With it, we have implemented a campaign that allows us to recruit previously lost business with a series of emails 90/60/30 days from the prospect’s annual renewal date as well as a series of two phone calls – all pre-programmed and automated. In summary, although we have only scratched the surface with what is possible with this software, we have made steady progress with the readily available assistance of almost every department at ROI. We are incredibly pleased with our purchase and plan to continue to dig deeper into its functionality to enjoy all of the benefits of marketing automation and Lifecycle marketing. "I am so pleased my company switched to ROI for our email marketing! Great product/fantastic people!" There are so many things that I like about ROI. First, the software is flexible and user-friendly (easy to navigate). I truly appreciate the campaign builder feature because it enables me to physically see and understand the logic/flow of my email marketing campaigns. Designing emails in ROI is also simple (ROI offers an array of templates to choose from, but you can easily create your own, too). The reporting tool is another feature I enjoy because I can quickly gather data on any number of things within any of my email campaigns. Secondly, I really value the ROI team (business development, client success, IT/development, etc..). They're good people to work with every step of the way (customer friendly and very focused on helping us achieve success). My company had an aggressive timeline for implementation, and the team at ROI worked hard and communicated well with us to keep the project on schedule. I'm so impressed at how consistent they are in responding quickly to any inquiries that myself or my marketing team has. I really don't have any major dislikes. However, I would gladly welcome an update to the software that would allow the user to be able to back out of the page he or she is in without having to start at the home page in any general section. It would make navigating within the software a little more efficient. I am so pleased with the decision my company made to contract with Right On Interactive. They're software is great, and their people are fantastic! Since we have been using ROI's software, we have seen an increase in deliverability and response rates to our communications. Right On Interactive offers a unique Lifecycle Map and deep segmentation capabilities that have changed the way we approach marketing automation. The Right On Interactive team lead our stakeholders through a series of discovery sessions and a lifecycle workshop to create the foundation of our marketing communication plan. The level of attention and service we've received from Right On Interactive is unsurpassed. When it comes to designing emails, I have used products that seem slightly more intuitive but I believe that would only be a potential issue for a user who has no previous experience. From a lead generation perspective, we're able to move prospects down the funnel more intelligently by creating segments based on demographics, firmographics, lifecycle stage and level of engagement. As our content and messaging has become more relevant, the effectiveness of our marketing has improved tremendously. We've also improved our customer communication by aligning email automation and Salesforce task creation with our internal business rules specific to customer class and status. "On par/better than Eloqua, Marketo, Pardot"
In addition to the typical features you expect from a marketing automation system, ROI has a really unique contact lifecycle tool - it helps you visualize (and build segments) on your contacts in their various states of development. Best part of that: the GUI is drag-and-build. As the executive sponsor, it's important that I be able to USE what we have...I don't want (nor can I justify) a full time headcount for an Eloqua or Marketo expert to do tricky stuff. We also love the fact that they are affordable AND very customer-focused. As with any sophisticated platform, there is a learning curve on our part and the ROI team goes above and beyond their service level agreement to make sure we are happy and productive on the system. Finally, we love that the worked with our existing systems (SFDC, DiscoverOrg) immediately and we don't have to do a lot of bouncing around to get work done. As with innovative platforms like this, there are always little things we would like to see on the roadmap. While the team does their best to address our needs, we have *on rare occasions* had to wait for a feature. That said, we are a small company without a lot of pull so we would expect the wait time to be double or triple if we were dealing with the bigger vendors. When you are looking at Marketo, Eloqua, Pardot, MailChimp, etc. take a look at ROI. For a very reasonable cost, you get a lot more than the lightweight email systems and a good platform that competes with the big guys. "Everything about the product and ROI team has been nothing less than fantastic!" The ROI platform makes managing the customer lifecycle very simple. From scoring leads and contacts to managing drip and lead nurturing campaigns the platform takes a complex topic and makes it very easy to understand and use. Setting up and maintaining the platform has taken more IT resources than we expected although with a technically savvy marketing group I don't see this being an issue. I definitely recommend the ROI product to anyone looking for marketing automation. The team at ROI has been amazing to work with and really take the time to understand your business. This is a huge benefit during implementation as they worked with us to ensure the setup was done correctly for the way we run our business. Both the platform and the on-going support we get from ROI has been amazing. We actually implemented ROI after failing to implement other marketing automation platforms. Implementation was seamless, the learning curve is not very steep and we were up and running campaigns very quickly. We have been trying to run email marketing campaigns for years with no success. We are now running complex campaigns integrated with Salesforce.com and seeing very high open rates. We plan to keep adding campaigns and integration through APIs to really drive or revenue and growth. "Great Option with Excellent Support"
We are several months into a transition to Right On from another solution. The onboarding has been excellent and the level of service and responsiveness is excellent. Their team is very well versed in their product and how to make it work for your particular use case. The solution itself is robust, allowing us to create the segments, content and programs we need to advance our strategy. I particularly like the lifecycle approach and the visualization tools that are encompassed within it. I believe that, over time, they will prove extremely beneficial to us in driving adoption and increasing revenue across our entire customer base. ROI is building out additional functionality currently that I believe will improve the effectiveness of lead generation (such as progressive profiling, which just rolled out) that I think will enhance the usefulness of the tool. The lack of some of these functional elements to date, while not major roadblock to our implementation, has caused us to work around their absence. I believe that most of these will be addressed in upcoming releases. I would suggest speaking to them about your specific use case and exactly what you are trying to achieve through an implementation. They are very good at identifying how the solution can work within the framework of your particular business challenges. I also highly recommend that you ask for referrals. These proved critical for us during the selection process. Driving new product adoption among end users, increasing product participation among channel partners, developing community and, ultimately, increasing revenue through cross sell, upsell and new conversions. As a result of our ROI transition, we have improved our data underpinnings, refined our segmentation methodologies and fine tuned our communications strategies for improved effectiveness. "Customer Lifecycle Marketing done right." Full disclosure: Right On Interactive was a client and we've used the product for another client of ours. We've been working with Right On for the better part of 4 years, and they truly were the pioneers of customer lifecycle marketing and the software reflects that. This is not simply a marketing automation platform; it is tailored to educate and assist marketers at every level of their lifecycle, which, in turn, serves their customer lifecycles. What I like the best is the ability to scale with this product. Even if your organization is just ready for email marketing and landing pages, the software can be used for that, while introducing the layers of advanced analytics (like engagement scoring) at those stages. Once you're at a point where you can advance to the next level, it's easy to do so. I also like the recent UI and UX changes. The product continues to improve because the team listens to customer feedback and wants to create a product people want to use. While the product has improved, there are still some UI and UX considerations they need to take into account. They also need to expand and invest in integrations, but I've been told they are already working on those. I'd recommend being dedicated to the on boarding process and setting timelines for yourself so that you can use the product as efficiently and effectively as possible. If you don't make it a priority, then you won't use it to its fullest extent and your marketing will suffer as well. Also, stay in touch with your client rep. They are so incredibly helpful and will make sure you're set up for success. I'm getting more eyeballs on my client's content and giving them names and emails of people who are highly engaged, which creates a seamless transition for sales and marketing. It also provides us with a detailed view of the people who might not be as engaged anymore. Therefore, we can tailor our communications to try to get them to come back to the site and engage. Customer service and support team has been phenomenal. They made deployment a painless process. Felt they completely understood our direction and marketing focus. The platform provided use the ability to blend multiple datasets to get a better picture of our customers. A/B testing. The current process is heavily manual. While some of the industry leaders have automated the entire A/B testing modules. The platform does a nice job of reporting around a particular event/email. However, I'd like to see more reporting around overall performance trends. Our focus has been on increasing our 'share of wallet' with our clients. This platform has given us that visibility while our previous marketing automation platform was never able to give us that visibility. "ROI helps provide visibility to your customers and prospects"
They have a very unique system that helps provide visibility into which bucket your customers fall.. ie. too small, typical, ideal, or too large. It also helps you identify how engaged you are within your customers/prospects. Although they are getting better and it has improved a bunch, the ease in creating segments can be a little difficult. Too often we hear a customer say "I didn't know you do that." By utilizing this system and providing value based content to our customers we have become a resource that has also helped us not only promote additional products but also reinforce our brand as striving to be a trusted advisor to our customers. The entire staff at Right On Interactive, especially Amanda and Meghan, have been amazing. They offer an incredible level of customer support. They not only help implement our ideas, they are constantly bringing new and innovative ideas of their own to the table for us to consider. I consider Right On Interactive a key partner in our success. Our experience with Right On Interactive has been nothing but positive. I highly recommend Right On Interactive to any company that is looking to automate their marketing programs. The ease of use, the value, and the support they offer is tremendous. With the help of Right On Interactive our email marketing program has grown by leaps and bounds. We are much better at measuring customer engagement and using that information to grow sales. The ROI integration with our website and Salesforce CRM has helped us increase revenue and reach more customers. Right On is great for the ease of use and speed to get started. I was able to setup a new client on Right On in just a few hours. The segmentation tool made it painless to setup multiple distribution and suppression lists using an intuitive UI while allowing our developer to create more complex queries writing SQL statements. The customer support team was extremely helpful and responsive to our needs. Our questions were answered quickly and always offered ideas and solutions to our requests. I would love to see some improvement with the online help. I have no complaint with the customer support team, but there are times where I like some additional reference materials online when working late into the night. A comparable tool to Pardot or Hubspot in the SMB market. We considered Right On a stronger solution with our clients who had large number of contacts (over 10,000) and wanted to build automation into their email marketing strategy. Right On was a great solution for our SMB clients. These clients needed a marketing automation solution, but were too small to use the large enterprise solutions. However, they were too large to use the smaller ESP tools as they had a large subscriber list. Right On provided all the marketing automation tools we needed without the high costs. There are so many possibilities with ROI. We have been able to take our lead engagement to the next level and better target our prospects and the tracking ability is fantastic. We have progressed significantly just in the year we have been using ROI. Since we using Microsoft Dynamics as our CRM, there have been challenges with the connectivity. However, ROI staff has been great at working through our data issues and offering solutions that could still make it work for the goals we set. DAta has always been an issue for us. Primarily because our company started using Dynamics and inputting data before there was a clear understanding on HOW to use the software. With that being said, everyone used Dynamics in a different way. We have made alot of progress in scrubbing the data, but there is still a long ways to go. Knowing we could do so much more with ROI once we get the data in better condition is something we are anxious for. ROI is very customizable, which is great. This has helped us streamline our processes between internal and external messaging. It integrated with Salesforce after some work, and helped create some fluidity with our other marketing platforms. We run a very customized and dynamic email process. It requires up-front training and setup time to get everything in place, and it isn't quite as intuitive as other systems we've used. Fortunate for us they just implemented campaign builder, which helps visualize things. Email Reporting is also limited. Take the time to learn all the ins/outs. Do no just jump into the program without any forward thinking or training. Our organization has increased the efficiency and execution of our internal and external marketing campaigns significantly. We are currently working toward increasing sales readiness and visibility. "Good Tool to Connect Lots of Data Points in Your Automated Marketing Tool"
The ability to connect lots of different data points to build profiles on your customers and contacts makes this a good tool for marketers looking to do more robust segmenting of their lists. The new campaign builder is much easier to use for drip tactics and has a better UI that helps avoid errors when building campaigns. Very programmer/database driven layout and design. Takes a larger team or use of Right On Interactive service hours to truly realize all the benefits of the tool. "Found - Customer Experience and Support That Matters"
I love that ROI cares about not only me but my customers/prospects experience as well. They have a highly collaborative team from soup-to-nuts. We have been able to successfully jump into the world of marketing automation with the combination of their features and functionality and their supportive team. THIS is what's important once you sign on with any platform because you will experience bumps and bruises when embarking into the world of marketing automation. The dev team acknowledges us! We have been successful in requests to the dev team that were resolved in a timely manner (which you just don't have happen in the world of ELQ, Marketo, etc.) and we feel a close connection with all different levels of the ROI team from our account manager up to the CTO. You will not get this attention from other companies. And at the end of the day, I am thankful that the system integrates with my CRM and is continuing to address my every day marketing needs for automation. I know this will be addressed very soon, but I am patiently waiting for integration with some additional applications and platforms like WebEx, GoToMeeting, etc. If you are looking for a robust and cost-effective solution, ROI is the right option for you. The support team has been super helpful and quick to respond to all of my questions. They definitely know what they're doing! There are so many different features that I don't know how to use them all. The segmentation is also complicated. I have been using the email campaign functions and those have been very helpful to stay engaged with our leads and current clients. It is nice to have insight into the lifecycle of all of our contacts. The flexibility of the program in that it allows you to make very granular data segments. The only portion of this product that was hard to grasp at the beginning was understanding the functional differences found in Programs, Tactics, Campaigns and Segments. Once those different pieces of the program were understood, creating campaigns using this system was actually quite easy. Also, when you "Save and Run" a Program (all the criteria to send a campaign to all of the contacts you have in your segment), it takes a while to queue up and actually send, something around 10-20 minutes. If you change anything after you click "Save and Run" and just save it again, you'll likely be sending that email to whomever is included in the change you made. Lesson, after running something, don't change anything until you receive confirmation of that campaign being sent. There really isn't anything that I can say I particularly dislike about ROI though. Once the mapping of your data is complete, the bulk of the process has taken place. With Salesforce, creating and then mapping a new field through a report to ROI is really easy. Creating segments is fairly simple as well once your get a hang of their syntax which isn't too difficult either ('%%TODAY(MONTH%% -6' for example). The biggest help was having a person at ROI (Mary) who was willing to step us through each portion of the setup and work closely with us so that using this product became a breeze. Being able to send marketing messages and have real time reporting on the segments sent. We have been sending messages to pure lists before this instead of having the flexibility to dynamically send to our contacts based on criteria set up in segments. This has been a life saver for us. "Love the product & the team"
Of all the automation platforms we deeply investigated, ROI was the most flexible and customizable. This system allowed us to aggregate our data and streamline our processes between four different systems exactly the way we wanted it look. We have some complex data-related business challenges that other platforms couldn't work around when they really dug into it, but ROI system was able to support and (and even improve) any data or process scenario we pitched at them. It integrated seamlessly with our other marketing platforms. Because this system is so customizable and flexible, it does require some training and setup time to get everything in place, and it may not look as intuitive as other systems. Fortunately their team is very knowledgable and have the expertise needed to get you going and moving forward. We have drastically reduced the amount of time required to execute our marketing campaigns. We have also provided sales with a better view of our customers, enabling them to prioritize and communicate much more effectively. "Right On Interactive is an exceptional company! " Right On Interactive has continually provided us with superior service! They were honest and transparent throughout the sales and onboarding process, and they have played a vital role in helping us achieve record-breaking results with our new email campaigns. Nothing, they have been great to work with and their software is first class! We needed to evolve our email marketing and customer communication capabilities. Since the launch of our first campaign using Right On Interactive’s software, we have experienced a significant lift in total email performance. Also, we have been able to change/enhance our existing campaigns more quickly as well as build new campaigns, which have improved our overall communications with our prospects and customers. The software itself peformed well for us with the scoring model being the 'secret sauce". However, while the software was great, it was actually the strength of the team that made the difference for us. The team was creative, flexible, engaged and proactive in helping us solve our issues and recommending enhancements. We really haven't found much we dislike yet about the system. For the scoring model to be its most effective, it is important for the outcome of the campaign to be well thought out in advance. We were attempting to enroll morer customers in multiple self-service applications to increase customer satisfaction results and reduce overall costs to our customers. "Great option to start your automation efforts"
The customer success team is awesome. Whatever you need done, they will support you. ROI understand the customer. ROI is a great option if your company is just starting out in automation or if your company has limited resources. The solution features is not all the way there. ROI is working on this. They have plenty of customer feedback and ROI is working to address the input. Great solution to start automation program. Converting, growing, retaining and recovering customers. "Great product and outstanding customer service. " Most flexible platform after meeting with other major players in this space. We brought in several disparate data sets in addition to integrating with our CRM system to allow us to perform the segmentation and modeling required. From a budgetary standpoint this was the greatest value that still met all our needs without compromising expertise and support. It does require minds that understand database structure, it's not a drag and drop. However, that said, it doesn't require one to be an expert due to the partnership mentality of this group. They truly want to help and see your organization succeed. Single view of the customer. The interface is easy to use and I really like the new 'Campaigns' tab. It helps me to keep things organized. ROI works great for our organization. It can do so much. There are a couple quirky things here and there but all in all it is a powerful tool. With our business, we have a very long sales cycle so nurturing leads is very important. I think we have been able to reach and continue to nurture more leads. The software does not have as many features as I thought it would have initially. Continue to improve the product capabilities and stay in touch with Market demands. We are able to track the lifecycle of our customers more efficiently and accurately. "Friendly and smart: Right On Interactive"
"Platform to generate emails to recruit talent"
The software was very simple to use and was quite interactive upon proper training. I had a couple of difficult conversations with customer service because I used the software in a different manner than normally marketed. Sending customized emails that would attract targeted talent. Learning about Right On Interactive? * We monitor all Right On Interactive reviews to prevent fraudulent reviews and keep review quality high. We do not post reviews by company employees or direct competitors. Validated reviews require the user to submit a screenshot of the product containing their user ID, in order to verify a user is an actual user of the product. Hi there! Are you looking to implement a solution like Right On?